LockCrypt functions as both a password manager and a file encryption utility. It can store anything from sensitive credit card data, passwords, lock combinations and more. Each item that is added to the secure database is secured behind government-strength encryption; all you need to do is setup one secure universal password in order to lock the data. 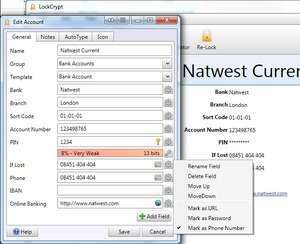 Without the master password, data saved by LockCrypt is not accessible. Version 3.10 is a freeware program which does not have restrictions and it's free so it doesn't cost anything. For security reasons, you should also check out the LockCrypt download at LO4D.com which includes virus and malware tests. Additional screenshots of this application download may be available, too.